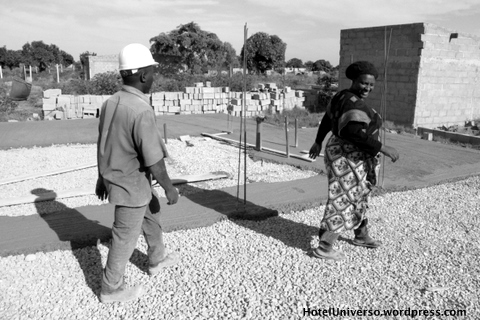 Graça surveys her home site with Mestre Daniel, the construction crew chief, Matola, May 2011. The pace of my research accelerated in May and, not coincidentally, you haven’t heard from me since then. Mostly I’ve been in Chamanculo; for several weeks I was living with Castigo Guambe’s family at the house I wrote about in the previous post. One of the highlights of recent months was the day my friend Graça invited me out to Matola. Like thousands of other Maputenses, Graça is building her dream house out there, about 20 miles from Maputo’s city center, on land the government recently parceled out for development. 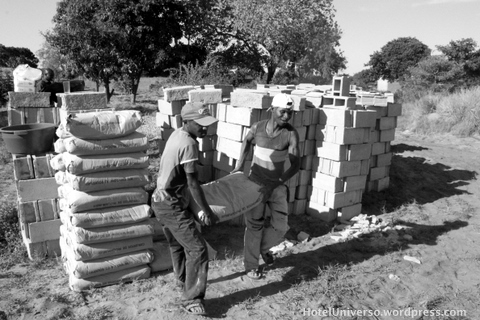 Graça, who lives at her mother’s house in Chamanculo, makes a living selling clothing and meat, and after years of saving up, Graça acquired a plot and bought enough bags of cement to get started on her own house. 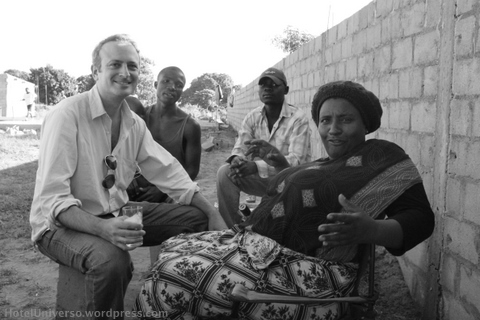 We went out to Matola on that sunny Saturday because her work crew was about to lay the concrete foundations. 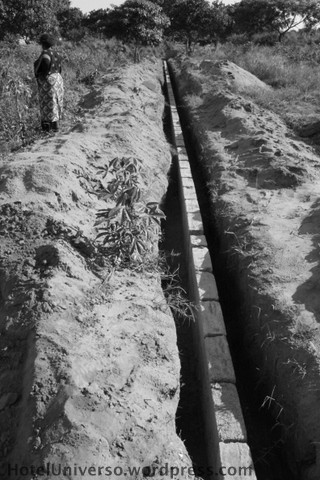 The laying of the foundations is perhaps the most important stage of the home-building process, at least for the builders. It’s when the client must perform a ceremony for the ancestors. At considerable expense the client cooks up the head of a cow and provides whiskey and beer, most of which will be consumed by the work crew. 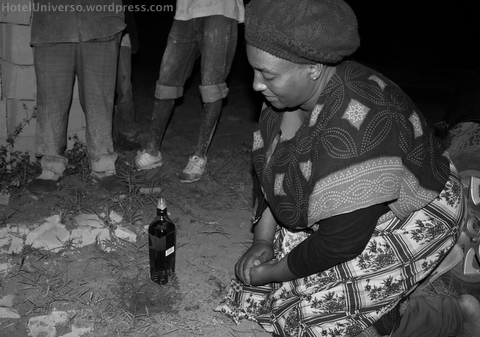 If there’s no cow head, if no alcohol is poured out in the ancestors’ honor, the project is all but doomed. Cracks, warn the builders, will likely appear in the foundation. Some builders inform their clients that they must also perform a ceremony when the roof is completed, or else cracks will appear in the roof, too. For the homeowner-to-be, all of this is in addition to the ceremony that’s performed when the plot is purchased, before the builders even show up. If you’re not careful with your ceremony expenses, you’ll run out of cash for cement. And you definitely need lots of cement. The photo below captures almost every step of the process. Sand, gravel, and water are carried by bucket to the mixer, where they’re mixed with cement. 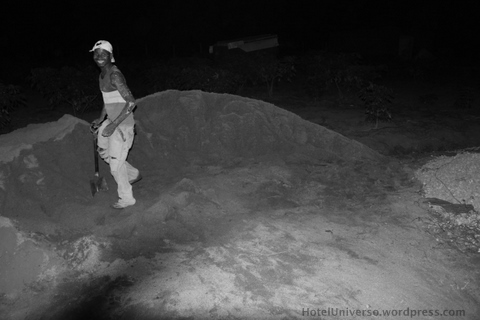 The resultant concrete paste is shoveled into a wheelbarrow, which is rolled to where Mestre Daniel and his assistant spread it with a spade like frosting over the rocks. They then tamp it down with the narrow end of a wood plank. It’s not complicated, but it makes for a long day. I’m putting a 9-minute video of this on YouTube once bandwidth allows. Those of us not on the work crew sit on cement blocks in the shade and drink. 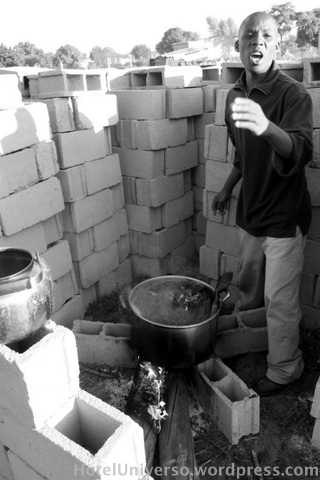 Hyto Chitombe (below), who is my research assistant in Chamanculo, has taken command of cooking the cow head. The head is mostly a gelatinous mass–it doesn’t have much meat to it. Want a closer look? Check out the end of that YouTube clip. Out here is more exurb than suburb, and sometimes it’s hard to distinguish from bush. When you build, you generally have to figure out on your own how you’re going to get water and electricity, and who knows when a paved road will get built, if ever. 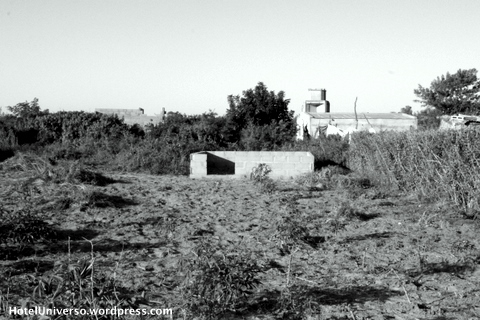 In Mozambique, all land legally belongs to the state, and selling plots is prohibited. Nonetheless, few acquire land without handing over the equivalent of thousands of dollars to either the plot’s current occupant or a local official, or both. 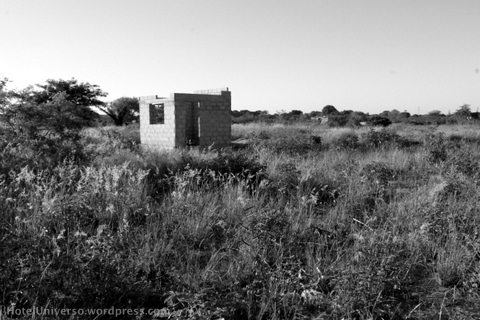 In the tall grass on every side of Graça’s property are houses in various states of completion. Most are just a minimal structure used as a marker to demonstrate to officials that the property is being improved. 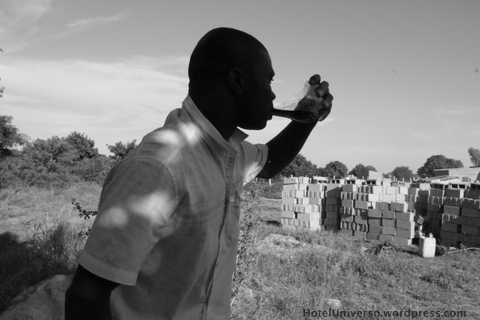 Few can afford to buy at once all the material necessary to build a house, not even Graça. Graça’s house, which theoretically could be built in days, is taking months. Most take years. In Brazil, to be a pedreiro, literally “one who works with rocks,” is considered by many a lowly profession. This is not so much the case in Mozambique. Daniel, head of this work crew, is called mestre, “master.” Mestre Daniel (below) receives the first cut of meat from the cow head, and his crew dives into the alcohol. Mestre Daniel gets beligerent, decides that one of his workers isn’t treating him with proper respect, and fires him on the spot. The worker receives no pay, and no meat. Graça gets on her knees and pours whiskey onto the ground. I ask if she’s going to say something. Her brother says, “You think the ancestors need you to speak for them to hear you?” I turn back to Graça, and she’s already back on her feet. The ceremonial component of the festivities is over. It’s late, but there is more work to be done. 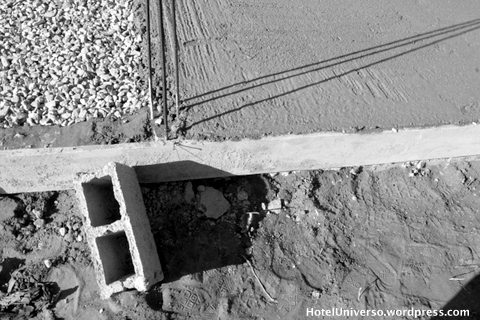 The foundations are supposed to be completed before everyone goes home, so that the concrete sets evenly. Car headlights are trained on the site, the crew works double-time, and then at around 11 p.m., Mestre Daniel calls it a day. There’s still the veranda to do, but that will have to wait for the morning. 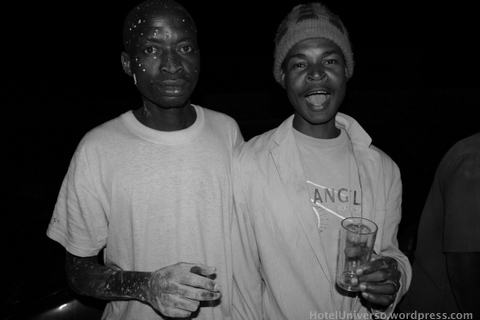 This entry was posted in Maputo, Mozambique, Uncategorized and tagged cement, concrete, houses, matola, pedreiros. Bookmark the permalink. Um cumprimento muito apreciado, Joaquim, sobretudo porque vem de um grande contador de histórias. Abraços, David. I enjoyed reading this story – would love to see the video as well. I met you in Maputo in April at UEM when you spoke on the Voortrekker monument in central Maputo. I’ve been busy teaching at Rhodes (in SA) and also got married back in the States in June, so I haven’t been able to return to Mozambique. Hopefully I’ll get there by the end of the year. Would be great to chat with you again.